Many of you have heard about the awesome-looking bionic rex skin that is only available for Xbox one players of ARK: Survival Evolved. The skin is not given upon buying the game, like the Parasaur founding father skin on PC. Instead, you need to earn the skin by playing the game. Currently the exact way in which you can earn it is unknown (Update: Not anymore, scroll down to the “How to get the skin yourself” section to see how you can obtain it!) , and therefore Wildcard had created a contest. The contest was about the first person to get the skin on an official PvP server on Xbox and tweet about it. The price you could win? 200 dollars! On the 30th of December, just two weeks after the game was released on Xbox, a tweet with a screenshot of the bionic rex skin was send to Wildcard. This meant the end of the contest, but not of the secret surrounding the way in which the skin can be retrieved. The person that won the contest is currently not telling the way in which he (or his tribe) got the skin, so people are still looking into the actual requirements. The devs have stated that you “need to collect things” and that it “is hidden dark and deep“. Another hint we were able to find was that it appeared to be “obvious”. How to get the skin yourself? Collect all dossiers– it seems that you need to collect all dossiers on xbox one to get the Bionic rex skin. This means that you need to tame all the creatures that are tameable, and kill the ones that are not (kill them yourself to get the dossier, so not with your dinos). In order to find out which dossiers you still need, and the way to get them, you can check out our post on the Survivor Profile. When you’ve got all the dossiers, you will get the Bionic Rex skin (together with a Survivor’s Trophy and Survivor’s Hat from the Broodmother). A little fun fact: when you die and respawn, you will receive another Bionic Rex skin. This means you can get multiple skins by respawning and saving them in a storage box or on your dinos. A bit of advice: if you still need to tame some creautures to get the dossiers, but you don’t have any use for them, go for low level ones. You can use our taming calculator to guide you in the amount of resources and time you will need. Kill the Broodmother – This is by far the most popular speculated way in which you can get the skin. The idea is that you will have to get all the artifacts, spawn the Broodmother and will receive the skin upon killing her. This sounds as a plausible way, since it took 14 days to get the first bionic rex skin. However, since the way to obtain the skin was “obvious” and not hard, according to the tweet, don’t put 100% on killing the Broodmother for the skin.Multiple people report that they did not get the skin after killing the Broodmother, so it seems this is not the way to get it. Collect items – There is also the possibility that you need to collect certain items or combine them someone. The devs have stated that you “need to collect things” and that it “is hidden dark and deep“. If anyone has any insights in the items that need to be collected, or where you need to put them, we’re happy to hear about it. Red supply drops – Another way to possibly get the skin would be supply drops. The idea behind it is that the red drops (which can be opened at level 60+) can contain the skin. This applies for both the supply drops in caves as those on the Island. Killing Rexes – Some people also say that it will be just like the Rex helmet skin: kill a rex and you will have a small chance to obtain it. We don’t really think this is the way to get the skin, but since it might be a very slim chance it is very difficult to stop considering this as an option. Killing alpha Rexes – There are claims that alpha rexes will drop the skin with a very slim chance, so keep an eye out for them and go on a killing spree to know for sure. In case you have any other possible ways to get the skin, please let us know and we will add them to the list. If you have tried one of the stated ways in which you could possibly get the skin, but it didn’t gave you one, we are happy to hear about it so we can remove it from the list. That way people will not be wrongly informed and can focus on other ways to get it. Together we will be able to find out how to obtain it so everyone can enjoy the skin. 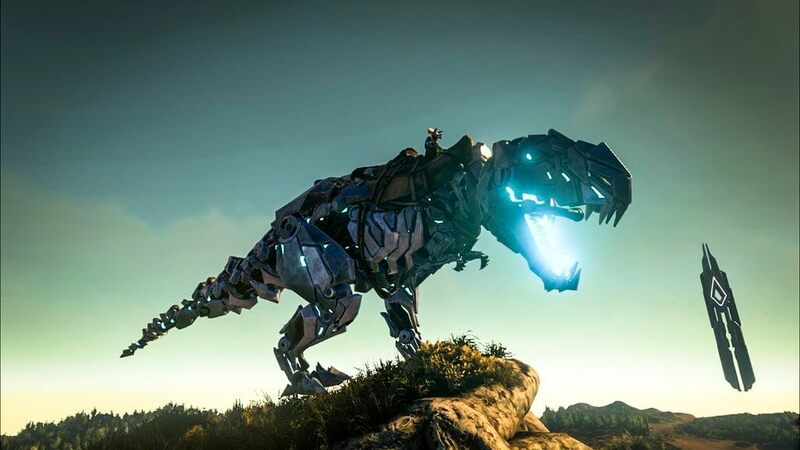 In case you have actually found the Bionic Rex skin yourself (even if it is on PvE or an unoffical server), we would gladly know how you obtained it! You can contact us by leaving a comment beneath this post, or by using the contact form. How do I get the Bionic Rex skin? We’ve stated the procedure above, but in short it is getting all the dossiers in your survivor profile. Can I trade the Bionic Rex skin? Yes, this is possible. However it might not work directly (e.g. dropping the skin itself). Instead, you could apply it to a saddle and then drop the saddle with the skin applied. Will I lose the skin when I change servers? No, the skin is registered on your account. This means that no matter where you go, even if it is another server or unofficial server, the game will recognize it is you and give you the skin, trophy and hat upon spawning. Can I get the skin on single player and use it on official servers? This is actually possible do to. So you could go around your single player game with increased tame rates and kill / tame everything you need to complete your survivor profile and get the skin. If you then go to an official, or unoffical, server, you will receive the skin again upon spawning. Can I get multiple skins? Yes, every time you respawn you will receive a new one. So if you have multiple rexes, you can apply the skin to one, respawn, and get another one for one of the other rexes. Does the order of the dossiers matter? No. As long as you have completed all dossiers in the end, you will get the skin. This means that you don’t have to kill the Broodmother as the last creature. Thanks to everyone that participated in finding out how to get the skin! Next Post: Patch v229 – What’s new? Me and my boyfriend killed the broodmother last night, he got the survivors hat etc but no Bionic Rex Skin. Thanks for your comment :). It seems we can cross Broodmother off the list then. Killing rexes / alpha rexes is assumed to be a way to get the skin, so if you got the ability to go after those creatures, it might be useful to do so. If you happen to find the bionic skin in some way, I’m happy to hear about it! I’ll add it to the list of possibilities, thanks for your reponse! As Tyler said about collecting items, a couple of admins, one being Casanova hints *collect things* another says *Deep and Dark*, and the winner of the contest says it was *obvious*. What can be so obvious? Me and Tyler has tried countless methods, but he has a good idea of putting a rex egg in a machine and see what’ll go from there <—- I still plan to try this method despite the hints. “Deep and Dark” – Angler Gel possibly? Since Anglers are in the deep part of the ocean and they show the blue light. “Obvious” – Metal possibly? Because it’s Bionic, it’s made of metal. We killed a couple of Anglers ourselves but nothing skin-related was obtained, so cross out Angler. No, not saying kill angler for the skin, look at Tek, it glows blue, the only thing that glows blue in the game is Angler Gel. Sounds like it can be found in a cave then. Isn’t there any hidden passage in one of them that could lead to the skin? Caves are Artifact based locations, the ones without things in them currently will have Artifacts later. where would you even make the skin and how much would you need of the gel or metal ? I am collecting 6,000 Metal Ingots, 2,000 Polymer, 2,000 Electonics, 2,000+ Angler Gel, and I’m going to stuff random amounts into a Fabricator and Smithy and see what happens, and also my Inventory. Yeah, it seems that is the actual requirement for getting the skin. If someone could verify it with some screenshots, that would be awesome, but multiple people reported this is the way to go. Wouldn’t it still be possible that the giganotosaurus was the last dossier they needed? Then they tame it, someone completes having all dossiers and get the skin. Thanks, I’ve added the video to the article. Note: Once you have completed Dossiers you will get the Bionic Rex “Tek” Skin, Survivor Trophy, and Survivor’s Hat Skin. And every time you die you will get another copy of each. Hello, if I move to an another server I will have the skin in the inventory of my new player ? The skin should be independent of server, but I’m not 100% sure about this. As long as you’ve completed all the dossiers, you should get the skin on every respawn which would mean that you will also get it if you spawn on a new server. Somebody just ran up to my thatch house and GAVE me a trophy and the Bionic skin! ??? I can confirm there seems to be a problem at the moment. Upon respawning or changing servers, since the addition of the 3 new dinos to the dossier, even once those are tamed it doesnt register a completed dossier again. So for the time being atleast, no more rex skins. Very dissapointing. This last patch has broken more than it fixed. If someone could reply me the full list of Dinos to kill and tame it would be appreciated. In the post we link to the survivor profile. There you can find an overview. It was wierd, a lot of people started joining my server by none of them were in my tribe except for one of them who doesn’t have bionic Rex, then the skin and the trophy magically appeared in my argentavis, has this happens to anyone else? I can’t get the skin on single player bc there are no spiders and bats inside caves and I need to tame them to get it. Any1 knows why there aren’t any animals inside caves? have ya’ll gotten the giga yet. Omg the bionic Rex skin is amazing I just finish the doissers I was so happy and exited. My little brother was so annoying about it so I had to let him try it. I have so many animal and right now my brother is test trying all of them. I love the ark survival game.